In the fall of 1974, the Planet of the Apes film franchise moved to CBS network television for fourteen hour long episodes. Planet of the Apes - the series - featured the continuing adventures of human astronauts Alan Virdon (Ron Harper) and Pete Burke (Jim Naughton), in the far-flung year of 3085 (starting March 21, 3085, if we're to believe the spaceship chronometer...) on a world run by intelligent, talking simians. In "Escape from Tomorrow," the introductory episode written by Art Wallace and directed by Don Weis, we begin with an old man (in a bad wig) being pursued by a child chimpanzee and his pet dog in a rural setting. My first thought watching this sequence was that it was a canon violation (alert! alert! ), since Conquest of the Planet of the Apes had established that a space plague had arrived on Earth in the late 20th century and killed off all the cats and dogs. It was the death of "beloved pets," in fact, that led humans to enslave apes...which would then lead to the uprising of the gorillas, chimpanzees and orangutans. This fact seems like something that the producers of the series should have taken care to remember, since it is a lynch pin of apes continuity. On the other hand, this sequence occurs a thousand years after the plague, so I suppose it is possible that "life has found a way," (to quote the Jurassic Park films), and dogs have re-entered the chain of life on Earth. 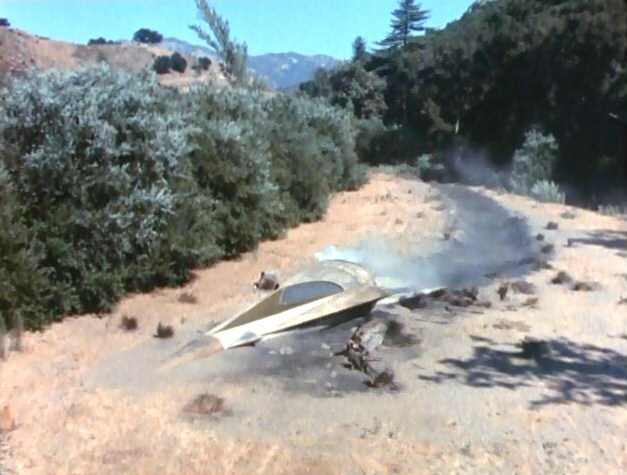 Putting aside this sloppy faux pas, the story continues as the old man hears a strange aircraft overhead and then finds the crash site of a spaceship in a nearby field. He rescues two astronauts (Virdon and Burke) but the third (Jones) is dead. When the shaken, disoriented astronauts awaken, the old man explains to the humans that apes rule this planet and that humans (who still have the power of speech here) are inferior underlings. Alan immediately wants to find a way to return home to his family (a wife and son). He recounts how the ship experienced radioactive turbulence near Alpha Centauri and he ordered Jones to activate the homing beacon. Burke is more defeatist. "This is home now, and you know it," he says. His words, however, carry a double meaning even he is not aware of. As the episode progresses, Alan and Pete meet Galen (Roddy McDowall) a friendly chimpanzee and member of the ape aristocracy who possesses many misconceptions about human beings, never having gotten to really know any. Worse, the astronauts face off with Urko (Mark Lenard), the chief security officer in Ape City who wants them dead. Now. Chief Counselor Zaius (Booth Colman) is willing to keep the astronauts alive, if only to learn of their technology and find a way to keep them from influencing the primitive humans of his world. Zaius is worried that the astronauts' love of freedom and independence will transfer to the indigenous humans and foster an uprising. 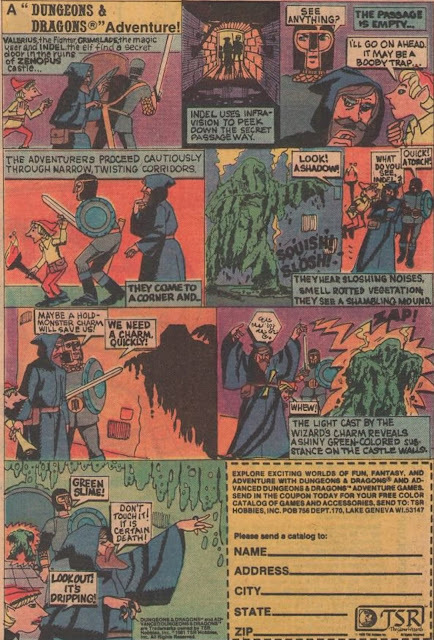 In this episode's scenes with Zaius and Urko, the writers accomplished something interesting and forward-thinking for episodic television in 1974. They began to develop - from this first episode - series mysteries that presumably would have been solved had the series lasted more than half-a-season. For instance, during a confidential tete-a-tete, Zaius asks Galen "did you ever have a recurring nightmare?" 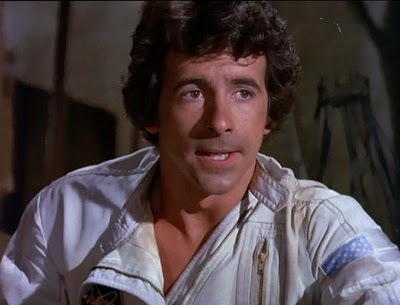 He then launches into a discussion of the fact that other human astronauts have arrived on the planet before (and again - it can't be the characters [like Taylor or Brent] we saw in the original films, because those events occurred in 3978...almost a thousand years after the events of the TV series). 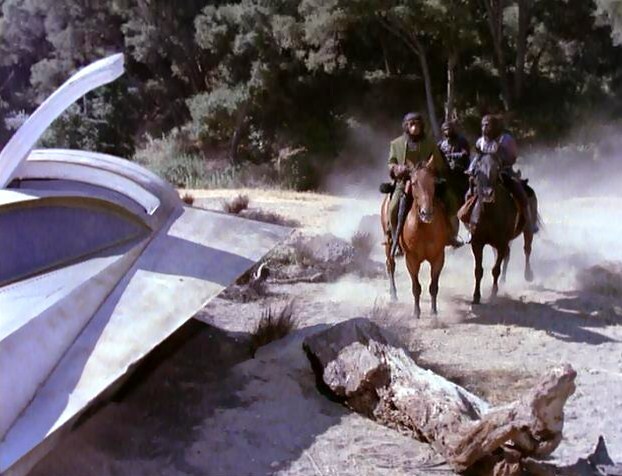 "Another ship, Zaius," states Urko, "it's hard to believe." One can imagine that had the series lasted, viewers would have heard much more about these other astronauts and their (apparently-not-very-pleasant...) adventures on the planet of the apes. If that had been the case, the series would have been all the stronger for it. "Escape from Tomorrow" ends with Virdon, Burke and Galen allied and on the run, while Ape forces destroy their spacecraft. Fortunately for the humans, Virdon has recovered a small magnetic computer disk from the ship which - if they can find a computer in this post apocalyptic topsy-turvy world - might help them find a way back to their time. Future episodes involve the triumvirate traveling from one human province to another, in search of technology that can help them return to the Earth of the past. In the episode "The Legacy," the humans find working computers and a hologram of a 'future' human in a nearly destroyed 20th century city, but still aren't able to glean the information they require for a trip home. As we've seen, the original Planet of the Apes films served as brilliant social commentary on the turbulent late 1960s and early 1970s. They concerned (among other things): nuclear war, man's self-destructive nature, and the pitfalls and total hypocrisy of religious zealotry. By contrast, the television series limits its commentary to one fascinating subject: the issue of race relations, of a class society separated by race and species. This is an important point, considering this was the era after the Watts Riots and the Camden Riots (1971). The Civil Rights Movement was coming to an end for all intents and purposes, and suddenly here's a sci-fi TV show about "species" stereotypes and irrational, implacable biases. Galen describes humans as "laborers, farmers and servants" and was always taught to believe that they are an inferior breed. To suggest otherwise is heresy and treason on this world. But Galen is inquisitive and smart and looks beyond the stereotypes, finally. His experience with Alan and Burke makes him realize that human beings have feelings and dreams and hopes too. He asks Zaius's human serf what it is "like to be human" and then confronts Zaius after he learns that human beings have a history of technical and scientific achievement. "Why Zaius?" He asks. "Why should truth be against the law?" Galen also suggests that "maybe the world would be better if no creature" was deemed superior to another. This point-of-view makes him a strong ally for the fugitive astronauts, but his objective, inquisitive nature also makes him a radical and fugitive among his own people. Earlier today, I reviewed the 2001 remake of Planet of the Apes and complained about the lack of background on the part of Ari (Helena Bonham Carter). She was a human rights activist, but we didn't understand why or how she came to this perspective. By contrast, "Escape from Tomorrow" at least lets the audience share in Galen's development on that front. We see him questing for answers and learning, step-by-step, about human beings. 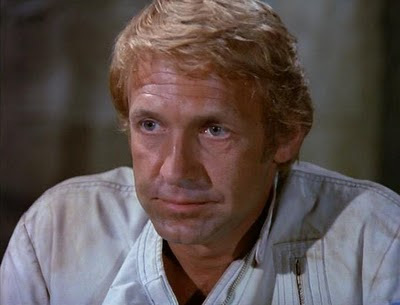 Another element of the Planet of the Apes series also seems to derive from another 1970s real life source. Namely, Zaius and Urko engage in a secret cover-up to destroy the spaceship and keep knowledge of the astronauts a secret from the general populace. In other words, the ape ruling class is working against its people (both human and simian). The apes live in a rigidly conservative or traditional society here, one where the status quo must remain intact at all costs, and the aristocracy lives in mortal dread of losing control, of seeing their imposed "natural" order change. "Heresy" and "treason" are common accusations for those who reject ape dogma. The idea of a cover-up and an authoritarian government (it's legal if the president says its legal...) surely reflect the Watergate Era, and Nixon's imperial presidency. All of that was coming to a head in 1974 America as this series aired. 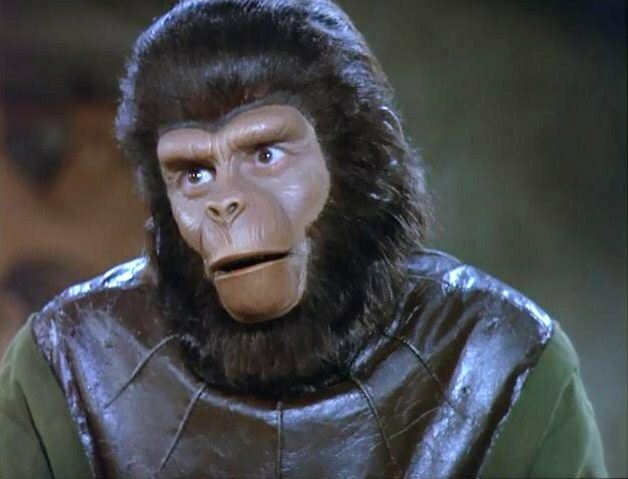 Yet too often on the Planet of the Apes TV series, the story lines and plot details felt uninspired and repetitive. It all usually came down to one of the three heroes captured by the apes and then rescued by the other two cohorts before the hour was up. And yet, I remember this series with tremendous fondness and affection because it had a great deal of value in terms of depicting a society separated by class and race. By putting white humans in the inferior position, the series makes quite a few trenchant points. Ultimately, that's the purpose of good science fiction....to comment on society, and here the set-up is nearly Swiftian. On top of these elements, the series features good actors and a modestly well-drawn future world, thanks in part to the costumes left over from the feature films and the occasional use of stock footage (for Ape City exteriors, for instance). I suppose to enjoy the Planet of the Apes series to its fullest, you must forgive the repetitive, action-oriented storytelling a bit and be willing to look for the underlying points, the subtext. These factors are present in most episodes (especially "The Trap," one that finds a gorilla and a human - Urko and Burke - trapped in an underground subway system together...), but also just a tiny resonance in quite a few programs. If this series had lasted more than half-a-season, perhaps we would have seen the underlying social commentary rise to the surface more frequently. John I still remember as a boy on Friday the 13th of September 1974 watching this first episode of POTA series at 8 p.m. on CBS.